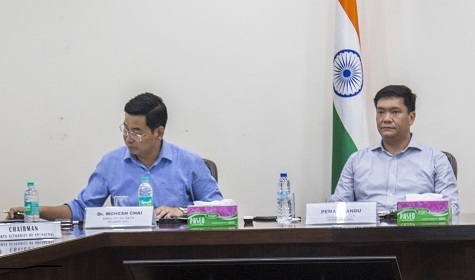 Arunachal Pradesh Chief Minister Pema Khandu, while chairing the second Annual General Meeting (AGM) of the Sports Authority of Arunachal (SAA) in Itanagar on Monday morning, beckoned SAA and the Department of Sports to proactively work for development of sports as ‘potential in the youths is immense in Arunachal Pradesh’. Coordination, he asserted is urgently needed amongst the SSA, Department of Sports and various sports associations including the Arunachal Olympic Association for growth of sports and sportspersons in the State. “There’s no dearth of talent. But we have failed to nurture these talents by providing them the basic facilities,” he pointed. Khandu said that the Central Government under the leadership of Prime Minister Narendra Modi and Union Minister of Youth Affairs and Sports Col Rajyavardhan Singh Rathore is giving massive impetus on sports through programmes like the Mission Olympic 2020. He said the ambitious project of Khelo India is aimed to scout and nurture talents for the forthcoming Olympic Games and therefore the concerned state agencies have to give their best to produce world-class sportsmen and women from the State. “It’s time to buckle up and streamline the work culture for accountability and responsibility,” he said on a serious note. He urged the Department to focus on its core subject of developing sports and producing sportspersons instead of focusing solely on construction works. The Chief Minister also called for streamlining the recruitment process in various departments under the sports quota. As of now, 10 per cent jobs are reserved under sports quota in police and forest departments, while five per cent is reserved in rest of the government departments. However, the Forest Department is yet to implement the 10 per cent reservation policy and not all departments are abiding by the five per cent quota for meritorious sportspersons. Khandu observed that there are many loopholes in proper implementation of the policy and requested the new Minister in-Charge of Sports and Youth Affairs, Dr Mahesh Chai and the Secretary to study and streamline the same. As for the draft bill for bringing the SAA under the ambit of an Act, the Chief Minister advised the Sports Minister to have a look at the draft bill and bring it up in the State Cabinet for discussion. Dr Chai, who recently got the additional charge of the Sports Ministry, also observed that the government has not been able to tap sporting potentials up to the mark and said the department has a lot to do in this regard. He also expressed concern over the fact that those recruited under sports quota do not continue playing defeating the very purpose of reservations. On recent recruitment of coaches by SAA, Dr Chai suggested that continuation of their services should be based on their performances to up the quality of coaching. He also viewed that fund allocation to non-performing sports associations should be curtailed so that those performing and contributing well should be given preference. Co-Opted Member, Regional Director of Sports Authority of India (SAI) Subhash Basumatary emphasized on organizing more sports activities at the school levels. He observed that the state has very good existing sports infrastructures, which need to be utilized to the optimum. He also expressed surprise that the department is not utilizing the services of a noted football player like Gumpe Rime, who hails from the state. Basumatary lauded SAA Chairman Bamang Tago for his efforts in development of sports in Arunachal Pradesh and sought the cooperation of all stakeholders. Tago, in his turn, highlighted various activities carried out by SAA and its road map ahead. He proposed instituting annual sports awards like Sports Association of the Year, Coach of the Year, Sportsman/Sportswoman of the Year, Sports Administrator of the Year and Lifetime Achievement Awards for promotion of games and sports in Arunachal Pradesh. He reasoned that such awards would go a long way in encouraging all stakeholders and achieve excellence in games and sports. Also present in the meeting were Sports and Youth Affairs Secretary Dani Salu and members of the general body.